If you read yesterday’s post, you know it was Prom Night. The kids left for a night of fun and since we still had the Cooker going, we decided on something sweet, and this was it. It deliciously hit the spot, especially a la mode! If you are cooking at home, you can prepare all of this indoors and take it out to “bake” or if you are on the go with your Cooker, you can easily assemble this and melt the butter in a small pan. 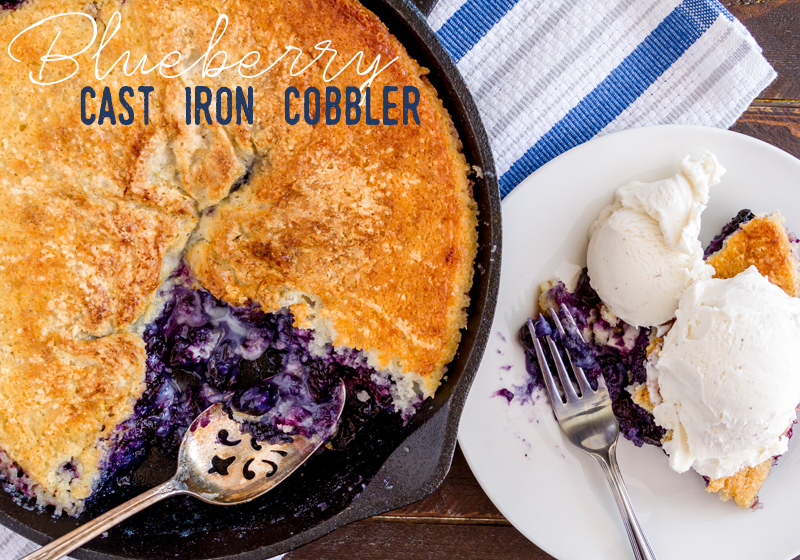 Place fresh blueberries in dutch oven along with sugar, vanilla, and orange juice. Stir to combine well. Sprinkle cake mix over top of blueberry mixture, covering completely. Cover dutch oven with lid. Place dutch oven on Kettle Hook and lower down into flame to “bake”. If a crispier topping is desired, you may optionally (and CAREFULLY) place either a small log or if you are using charcoal – about 10 briquettes onto of the dutch oven lid. Allow to cook for anywhere from 15 – 40 minutes depending on how hot your fire is. Once bubbly and top crust is cooked through and golden, remove from kettle hook.